Mauritius is a modern island surrounded by exquisite scenery. The beaches have warm blue-turquoise water. I love spending the day relaxing here. DEAR NICOLE, WHERE DO YOU HAIL FROM? I was born in Cape Town, South Africa, a very beautiful vibrant city with a population of 3.7 million. It has a rich history with many different cultures. Often called The Mother City, home to Table Mountain, golden beaches and vineyards. After I completed my tertiary education I embarked on a three year adventure working and travelling all around the world. This ultimately led me to where I am today, Mauritius. WHICH CHILDHOOD MEMORIES DO YOU HOLD DEAR? I have many fond childhood memories, always surrounded by family. Very often family and friends would gather to enjoy a braai (barbeque), a South African tradition. HOW WAS YOUR INTEGRATION IN MAURITIUS? 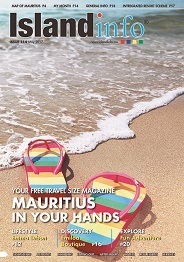 Moving to Mauritius and the transition from ‘tourist’ to ‘resident’ took some time to adapt to. During my time here I have been exploring, learning and so much more. I have discovered more about myself, other people and life itself. I am now able to understand Creole and French and enjoy eating the local cuisine. At this point it has become less of a foreign country and more like my home. WHAT DO YOU DO FOR A LIVING HERE? I am currently working at Five Elements Spa situated in the heart of Quatre Bornes. The spa has been open since 2011. Here we offer the finest body, beauty and therapeutic spa services in a completely stress-free environment. We use a skincare line which contains natural ingredients such as clay, algae, trace minerals and essential oils. Our treatments are based on Traditional Chinese Medicine to restore and maintain the body’s holistic balance of nature. I am passionate about music. It is a form of self expression and affects your mood. It can inspire, comfort, release stress and can bring people together. My day usually starts at six in the morning when my alarm goes off. I always eat a good breakfast to recharge my brain and body. Some mornings I try to fit in some physical activity to improve my health. I then proceed to finish any tasks that need to be done. I reach work by noon and perform numerous relaxing treatments on up to six clients per day. After a long day at work I return home after eight o clock and have my dinner. This is the time where I just like to wind down and take some time off for me. Happiness can come from the simplest of things. It’s loving yourself, loving your life and accomplishing your dreams.